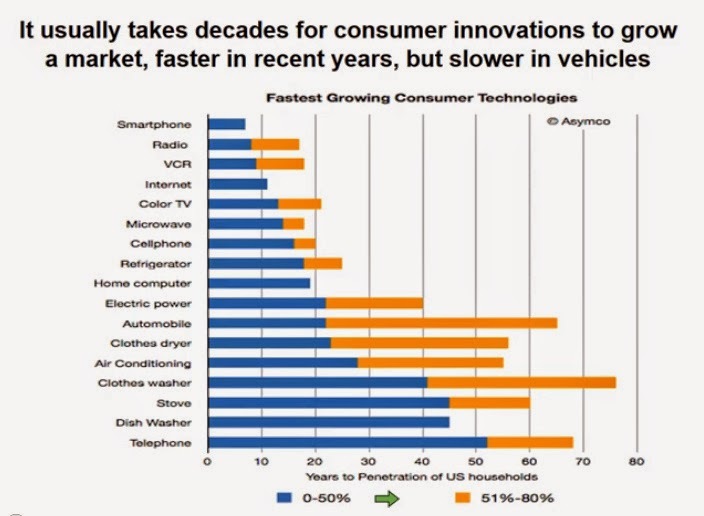 Electric vehicles significantly reduce the amount of energy needed for transportation. After the batteries degrade and their mobile life is done, these batteries can be reused for renewable energy grid storage. 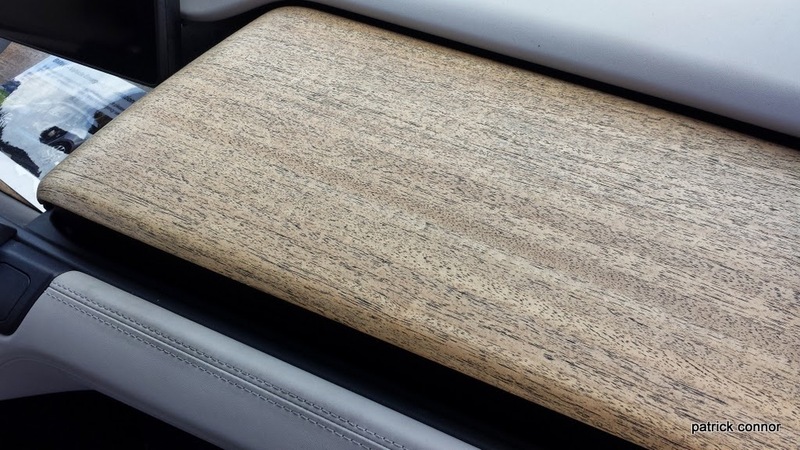 The materials in an electric vehicle’s batteries are not consumed as the batteries are used. This means when you are done with them, they can be recycled into new batteries. 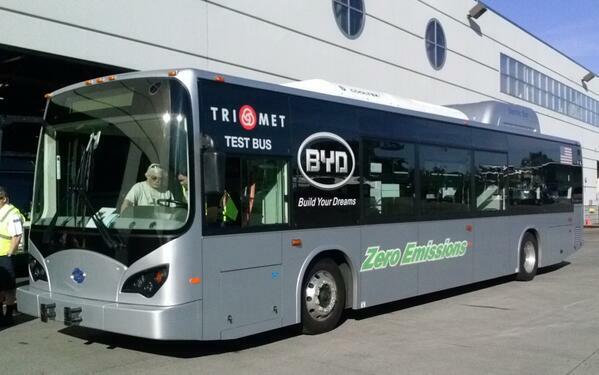 TriMet, the regional public transportation company in the greater Portland, Oregon area, is testing an electric bus from BYD. 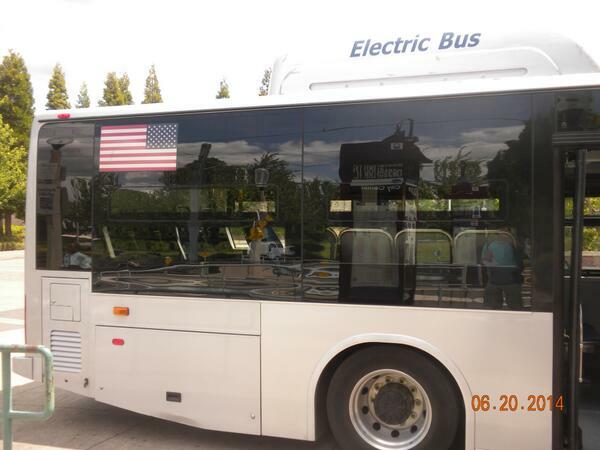 They held a Riders Club sneak preview on June 20th at the Beaverton Transit Center. Attendees were invited to kick the tires, talk to staff from TriMet and BYD, and take a quick ride on the bus. This report and photos are based on the feedback from attendees Rick Durst & Gary Graunke. TriMet said, depending on the route, the bus could be used for a full service day. The bus is built in Lancaster, California. A competing bus is made by South Carolina company named Proterra. That bus uses a smaller pack and DC quick charging. 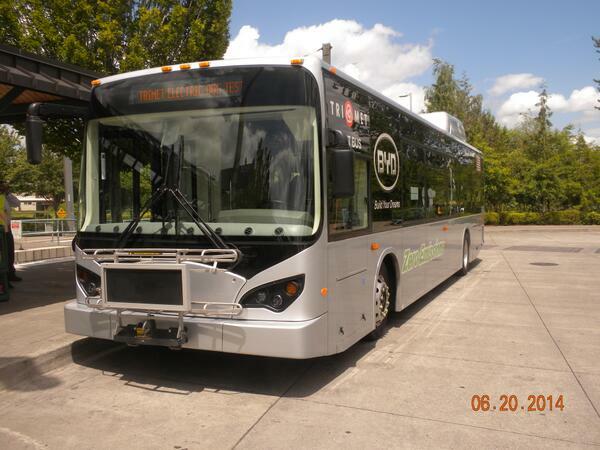 The range and recharge time of this BYD bus are already good enough for many TriMet routes. As batteries continue to improve, the viability of electric buses will also improve. BYD is a battery company--the bus is the easy part. OEVA is now an AmazonSmile partner. History Backs Up Tesla’s Patent Sharing - James Bessen - Harvard Business Review: "Some commentators have noted that Tesla’s move will help it hire talented engineers. Others see it as a brilliant PR move. They are right, but Tesla’s action is also central to their business strategy. There are real benefits to sharing knowledge that substantially outweigh the costs and this economic logic is very similar to the economics that motivated past innovators to share." 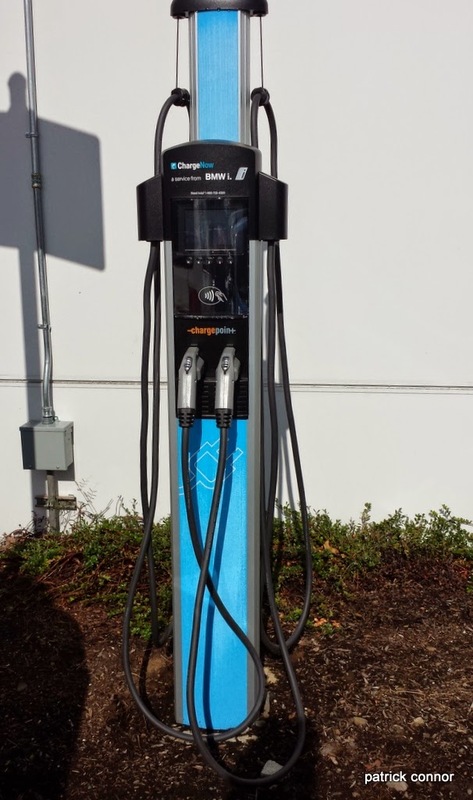 Portland has her first SAE Combo DC Faster Charge system. You can call CCS (combo charging system) or SAE Combo. It is located on Electric Avenue (SW 6th and Montgomery) on the Portland State campus. 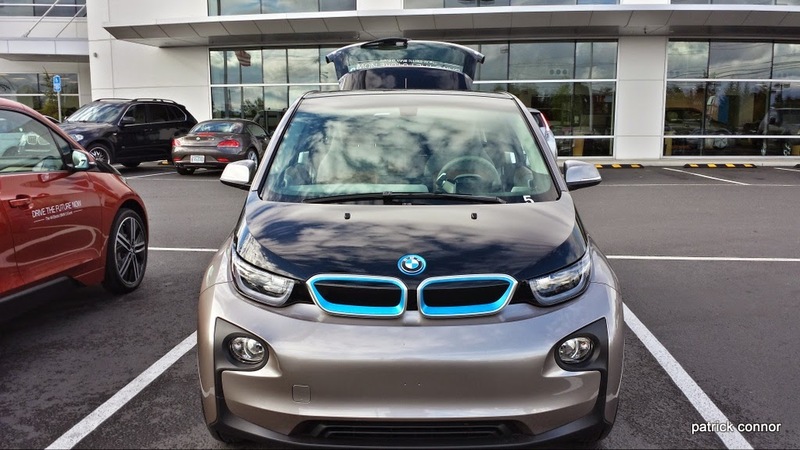 You can use this on the Chevy Spark and the BMW i3 (and more cars coming soon). The cool this unit from efacec is that it has both CHAdeMO and CCS so you can charge up a Nissan Leaf, Mitsu i-MiEV, or (with an adaptor) a Tesla Model S. This is one of 5 CCS units that are planned to be installed in Oregon this year. Elon Musk opens up Tesla patents; it 'isn't entirely altruistic': "Even if other competitors copy Tesla’s design, Tesla still gets to sell them batteries"
Now that the Oregon Coast Electric Highway is nearly complete, we’re showing coast residents and visitors that EV travel and ownership is very do-able, cleaner, and greener! 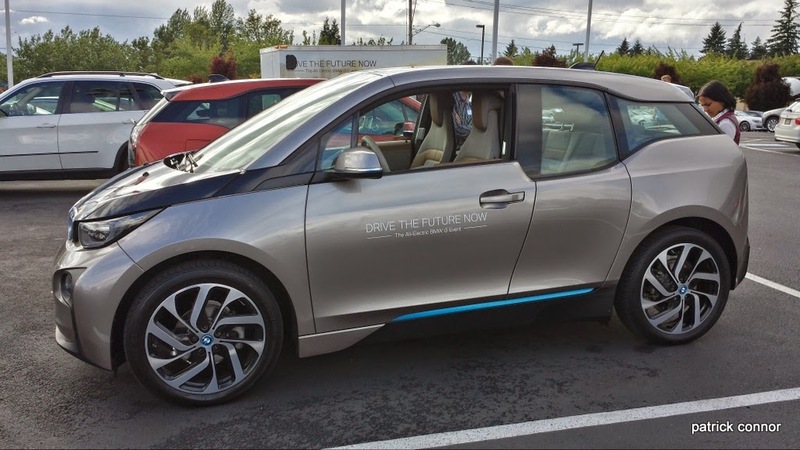 If you’re interested in a road trip to the Coast next week and flying the EV banner, then join the Waldport Beachcomber Days Parade entry on Saturday, June 21st. The event was held at PGE HQ at the Portland World Trade Center building. The key is officially handed off; she doesn't want to let go. After a couple laughs, Charlie eventually wins the key from her. This is one of only two e-NV200 vans currently in the United States. The other one is in the same evaluation program at FedEx in Washington DC. These two vans will travel the US for about a year and they will get new "owners" every 6 to 8 weeks. This will allow Nissan to collect feedback from many companies, large and small. The FedEx van is next scheduled to go to a family owned bakery. The bakery owners are Leaf drivers in their personal lives. 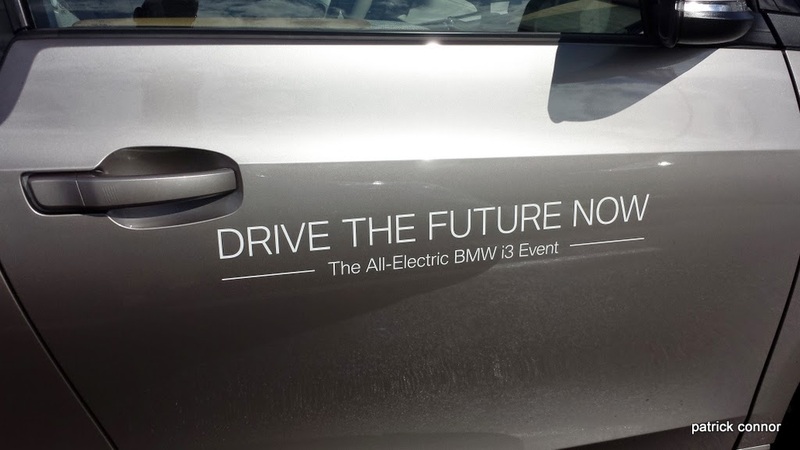 Soon they'll be able to drive electric at work too. Charlie Allcock of PGE behind the wheel. 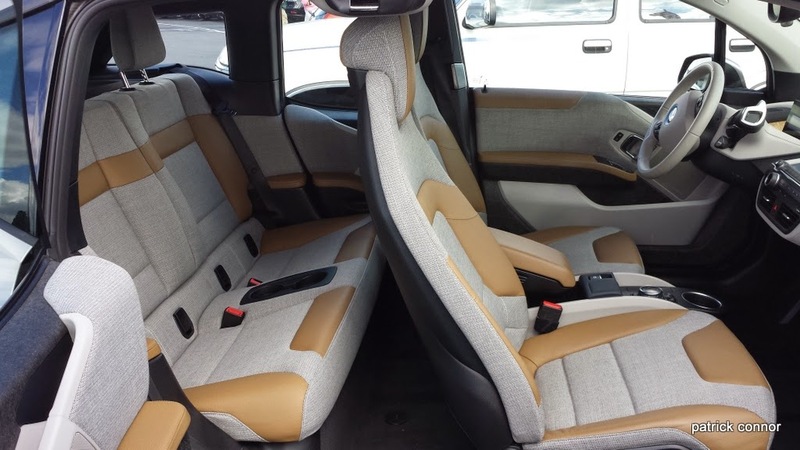 Charlie (an EV driver himself) said that PGE would love to get some of these permanently and if they were available today he would order them immediately. The van has plenty of room for tools and equipment. 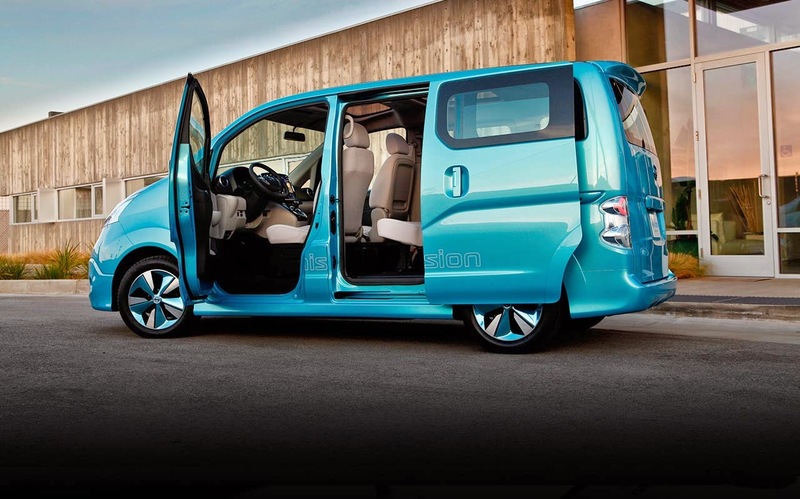 Sidebar #1, I didn't like the name e-NV200. It just seemed like a jumble of letters to me, but it is a fleet vehicle, so I guess a cool name is not as important. Later, I started thinking about it as Electric Nissan Van (eNV) and the name made more sense. I was told about the van arriving at PGE a couple a couple of weeks ago under a "press embargo". This meant that I could not disclose the information until this event. However, if you are someone that reads the MyNissanLeaf forum, then you might have read the posts by the PGE driver of the van. He loved it so much that he posted photos, talked about his experiences, and answered questions about it. I guess someone forgot to tell him about the embargo. 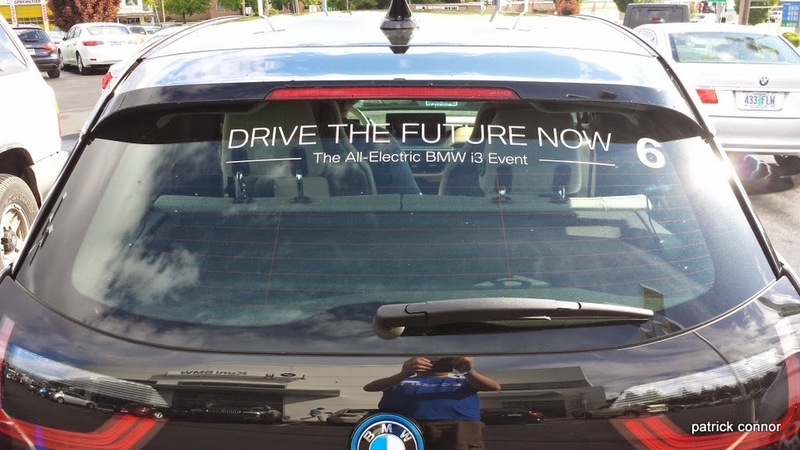 It has been said that driving an EV can quickly turn you into an EV advocate. This van is no exception. It was my turn for a test drive. I was surprised just how much like the Leaf it felt. I had the "EV grin". I assumed a work van would have stiffer suspension and a rougher ride but it felt just as smooth. The acceleration was also similar to my Leaf's. It has the same motor, so this is not surprising. I thought perhaps this one would be geared lower. It even stopped smoother than my 2011 Leaf. This is likely an upgrade that common to the 2013 Leaf. As we glided through downtown Portland, I did notice that the dash layout was different (see stock photo below). And the nav system was a Pioneer, rather than the custom Leaf system that included EV charging stations. The product specialist, Evan, that rode with me said they didn't have the US nav system ready yet, but would before it is rolled out here. Evan continued and informed me that the van could be configured the fleet managers' specifications. This model had the same 24kWh as the Nissan Leaf, but it would be possible to get more battery capacity; although he would not tell me what other size(s) would be available. Other options were also available such as 120V or 240V outlets (this one didn't have any) and all the options that the gas powered van has such as tool cabinets and roof racks were also available. PGE had a roof rack added to this one so they could carry ladders on top of it. There was one place I *had* to take the van, that was Electric Avenue, of course. In the photo above that is Evan, our e-NV200 product specialist in the photo above. Sidebar #2, I plugged the van into the Eaton Level 2 charger. That happens to be the charger that does not work with 2013 Nissan Leafs (or the e-NV200). There is a note on the charger that explains that Eaton has found the cause of the problem and that unit is scheduled to be repaired or replaced soon. That was fine the van had nearly a full charge and I just wanted it plugged in for the photo. I asked Evan a lot of questions about aerodynamics and load impacts to the range. He said that Nissan has not released any official data for this yet. For low-speed urban use, like PGE has planned for this one, aerodynamics are not too important. One of the points of this program is for fleet managers to get an idea where they can best utilize these and for Nissan to understand what changes the fleet managers would like to see. My first EV was a fleet vehicle, it was a Chevy S10EV that served its fleet life at Disneyland and then I got at an auction. This van was much nicer than a 1998 truck. I really liked it. The e-NV200 vans are available for fleet sales in the UK today, Japan later this year, and the US sometime next year. There they list the cargo space (4.2 cubic meters), max speed (75 MPH), and other specs you might be interested in. I recently did an 11-part article on hydrogen fuel cell cars. I covered H2 generation, infrastructure, costs, and many other aspects. 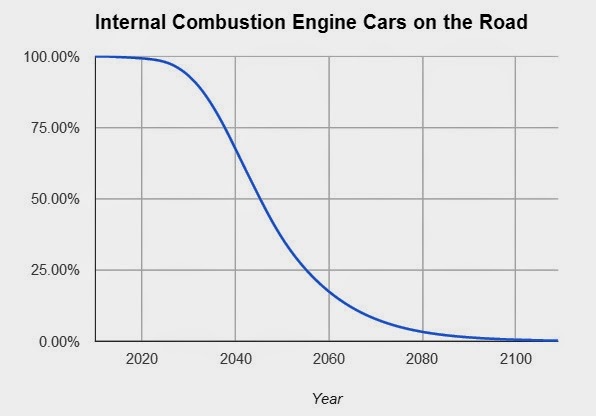 One thing I touched on in part 9 is that fuel cells vehicle manufacturers have alienated many current EV drivers. This article (link) in the SFGate, they expand on the point. 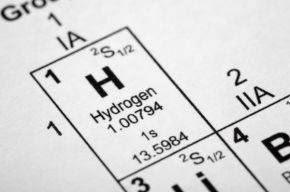 Who are the potential buyers of a hydrogen fuel cell car? 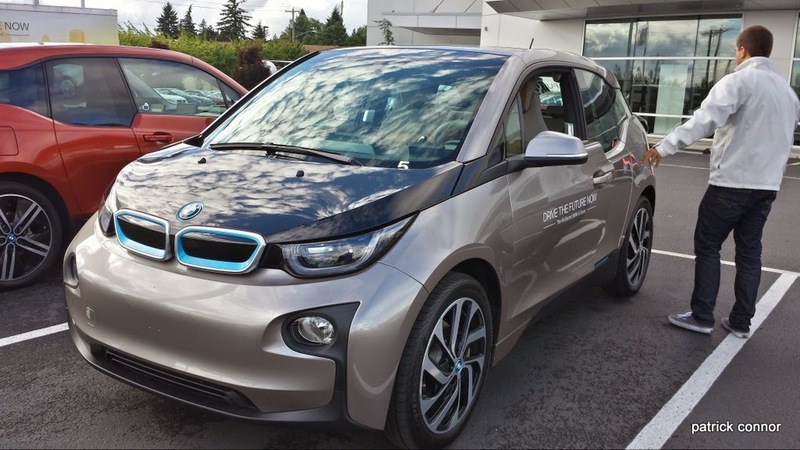 People that have been waiting for zero emission vehicles have bought plug-in cars. New people are being brought to the market by seeing how great their friends and neighbors vehicles are. 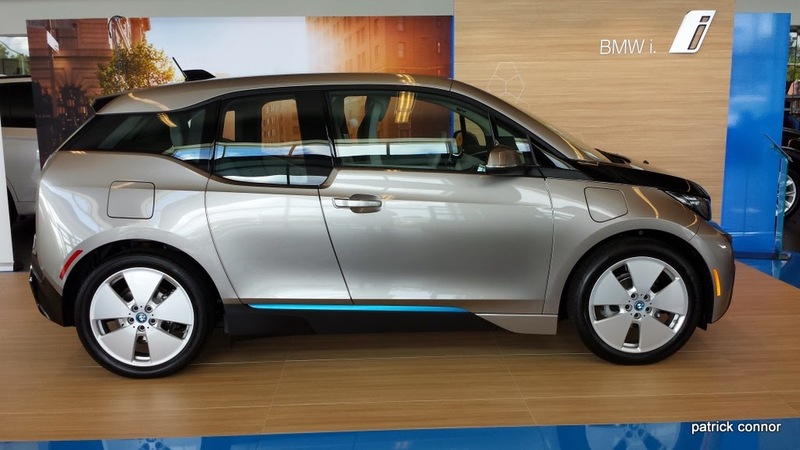 More plug-in vehicles are coming to market each year and they can "fill up" in your garage. What market does that leave for H2 cars? The gas-die-hards are not going to use anything other than liquid fuels and plug-ins dominate the alternative market. Perhaps there are a few people waiting for H2, but that alone would be a small market. Another point from the SFGate story: If it is so apparent that there is no viable H2 car market, why are Hyundai, Honda, & Toyota continuing to push this technology? In part 4 of my series I suggested that it may be "island thinking". On an island, a small amount of infrastructure can meet the needs of the population. This is not the case for the US. 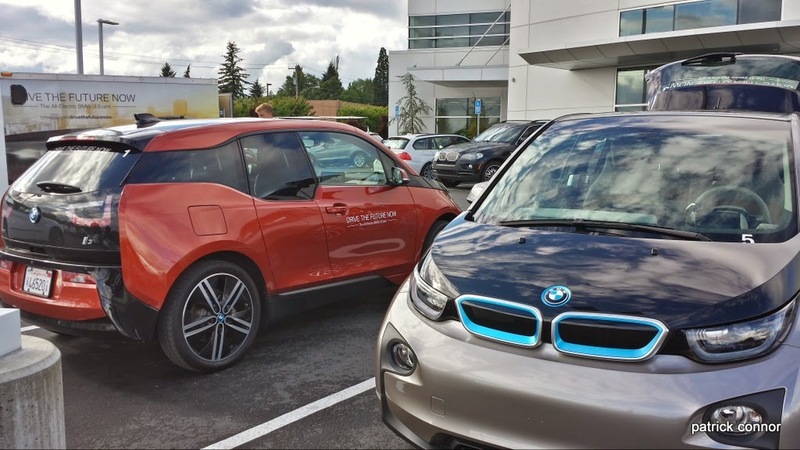 The SFGate story offers three financial possibilities to why these companies continue to push H2 cars. One, the companies have been investing research money into H2 development for more than a decade. The article suggests (although they don't use this term) that they are suffering from the sunk cost fallacy. Secondly, the article suggests that Hyundai specifically would likely have to pay licensing fees and/or patent royalties to develop plug-in vehicles. This would make plug-in cars less profitable to the company than a car without these licensing burdens. The third reason offered in the SFGate story is that car companies don't manufacture batteries. This means that they would be sharing the profits for a major price component of the car with another company. I have written previously, that I believe this is the primary reason that the EV1s were crushed. Auto manufacturers don't want their cars to be just a shell wrapped around someone else's batteries. Today, range and performance depend on batteries. For most car companies that means another company's technology. And worse, much of the profits go to the battery company. It was nice to see an article that examined these aspects of the H2 car market. 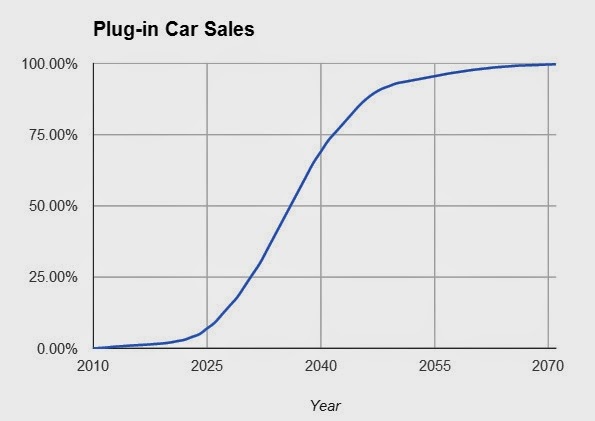 If you ever find market research data that shows the prospective market demographics for FCEVs, please share the link below.